'Total Siyapaa' is on the lines of other concept based films like 'Tere Bin Laden' and 'London Paris New York' that Ali has been a part of. 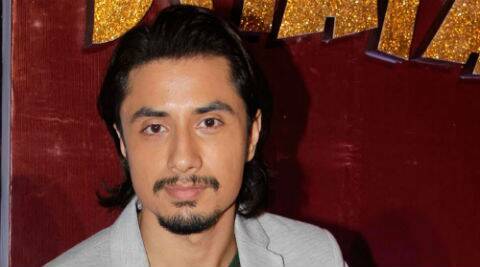 11 months after his last hit ‘Chashme Baddoor’, Ali Zafar is back on the big screen with ‘Total Siyapaa’. While the David Dhawan directed comedy was as ‘filmy’ as it gets, ‘Total Siyapaa’ is on the lines of other concept based films like ‘Tere Bin Laden’ and ‘London Paris New York’ that Ali has been a part of. “Mostly, what I look for in my films is the content of the script. Also, it works when such films are made on a tight budget. Like for example ‘Total Siyapaa’ was shot in 28 days flat. We could afford to do that as the script was water tight and we didn’t have to invent things on the sets. I could pretty much sense that the shooting would be smooth once Neeraj Pandey shared the script with me. It sounded very direct and balanced. Now that was a feat in itself because the very subject of an Indian girl falling for a Pakistani girl could have been a little sensitive. My director E. Niwas balanced it out in a humorous way,” says Ali. A remake of Only Human, which was a comedy of errors featuring a Palestinian boy and a Jewish girl, ‘Total Siyapaa’ has been suitably Indianised. What also brings in added fun is Kirron Kher’s performance in the film. Apparently, Ali shares quite a lot of screen space with the veteran actress who has a flair for comedy. Meanwhile, he also liked working with Yaami Gautam who is his fifth new female co-star. “What really distinguishes Yaami is that, she is a very real person. There are no airs that she carries about herself. She is always on time, is very punctual, humble and a wonderful co-star to work with. When you co-star is so nice, it is a delight to be on the sets. Also, the chemistry comes out very well. Yaami has been an absolutely no-nonsense girl,” smiles Ali before signing off.